Sorry about the dreadful pun – but LPs, and old electronics, do give off distinctive whiffs. Whenever I open the turntable on which I transferred this LP, I get a pleasing rubbery smell, which I think comes from the thick platter mat, trapped under the lid. It does a Proust, taking me back to my late father’s hi-fi and record cabinets (not to mention long, boring childhood journeys in hot cars with plastic upholstery), though I can’t honestly claim to remember the exact aroma of his various setups. Nor does this LP, from his shelves, smell of much: for one thing, HMV used translucent paper to line the inner sleeve, not the later polythene which has all too often degraded and left gunk on precious grooves. No, this disc was and is in excellent condition, and hardly needed cleaning up. I imagine few surviving copies of the original Westminster issues (on WL 5191 and XWN 18551), not to mention the first UK issue of late 1954 (on Nixa WLP 5191), would sound better – those pressings were never too good. Maybe the French Véga issue was better (sample a commercial transfer here, or even buy it here). The recording is close (which I like) and vivid, and I just love this performance. Love the work, too, which always seems to bring out the best in players, and I never tire of hearing new versions, but I’m esepecially fond of this one. I hope you enjoy it too! Frederick Riddle (1912-95) was the only one of these three musicians born in England: Pougnet was born in Mauritius, and Anthony Pini (1902-89) in Argentina, as Carlos Antonio. All became stalwarts of Britain’s orchestral, chamber music and teaching worlds. I’m indebted to Tully Potter, the leading historian of string players and chamber music, whose obituary of Riddle (The Strad, May 1995) relates that, before the war, Pougnet and Pini played and broadcast together with William Primrose as the London String Trio. After the war, Riddle replaced Primrose, although the name was taken up by a different trio of players. Our three had also played together in the Philharmonia String Quartet, which Walter Legge formed from his Philharmonia Orchestra, and, before that, in the BBC Salon Orchestra. Meanwhile, you can download this transfer of K.563, as six fully-tagged mono FLACs plus sleeve scans, in a Zip file, from here. As for the work, I reckon this was its fifth complete recording. The Pasquier Trio of France made the first, in June 1935, for Pathé (transferred to CD by Green Door of Japan); also issued in Britain and the USA on Columbia (transferred by The Shellackophile). They re-recorded it after the war for Les Discophiles Français (again transferred from disc by Green Door); issued in the US initially on Vox, and then by the Haydn Society (the latter remastered from tape by Music and Arts). 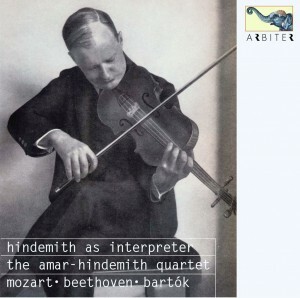 Meanwhile, Heifetz, Primrose and Feuermann had recorded it for Victor in September 1941; a well-known set, transferred by Biddulph, Opus Kura and probably others. Less well known are one of the Menuetti (but which? ), recorded by members of the Budapest Quartet for American Columbia in February 1945, but not issued until 1950 as a filler for the (obsolescent) 78 rpm set of Schubert’s ‘Trout’ Quintet with Mieczysław Horszowski and Georges Moleux; and a complete recording, made in April and May 1951 by the Bel Arte Trio (Ruth Posselt, Joseph dePasquale and Samuel Mayes) for US Decca, issued in the UK on Brunswick, and never, to my knowledge, reissued (as if…) or transferred. The biggest rarity and oddity, though, must be a Tilophan ‘Spiel mit’ set of extracts, seemingly one or both Menuetti, with the violin, viola and cello parts not played (by unnamed players) on successive sides. This was available by January 1938, when it was listed in a French magazine. If anyone owns or has ever seen any of these, do let me know! Over the last year and more, I’ve been investigating and documenting the activities and publications of three small organizations of the 1920s and 1930s which modelled themselves on Britain’s National Gramophonic Society (the subject of my PhD research). Although based in the USA and Japan, the founders of these societies learned of the N.G.S. from articles, notices and advertisements published in its mouthpiece, The Gramophone. Emulating the N.G.S., they aimed to supplement the output of commercial gramophone companies, by arranging for uncommercial music to be recorded and pressed in limited editions for their members. I hope to share online soon a detailed study of one of these societies. In the meantime, here’s a preliminary sketch of another. It’s the least known – yet its second issue was one of the milestones of the ‘78 rpm’ era: the premiere recording of any of Bartók’s string quartets. The set would not be ‘duplicated’ for a decade: Bartók No.2 was next recorded in April 1936, by the Budapest Quartet for H.M.V. The Amar Quartet’s pioneering version was soon made generally available, so it’s not particularly rare, unlike the original Japanese society issue, though it’s rightly prized by collectors. True, you sometimes read that it was commissioned by a group of Japanese enthusiasts, but no more than that. ‘The Western N.G.S. has now a sister in the East. Its name is as above and means “Tokio Good Record Recording and Distributing Society,” address, c/o M. Anan & Co., No.4, Awajicho 2-chome, Kanda, Tokio, Japan. It was established in 1925 and has 385 members. ‘The first issue was Scriabine’s IX. and X. Piano Sonatas, played by Alexander Sienkiewicz, on three 12in. records at 5 Y.’s each (presumably Yens). Someone in Tokyo took pity, and in August 1926 The Gramophone printed an English translation of one of the circulars, sent in by the Japanese society’s secretary. It was headed ‘Declamation’, exemplifying the language barrier which then divided music-lovers and record-buyers East and West, and still does. I don’t know of a comprehensive English-language study of Japan’s early record culture. The standard Japanese-language history of recording has apparently not been translated, so I haven’t been able to consult that or any primary Japanese sources. (I’m hoping to convince a kindly speaker or scholar of Japanese to translate or at least précis the bits I need.) Everything in this post I’ve gleaned from English-language sources, and from invaluable information kindly provided by a contact in Japan. Luckily, the circular published by The Gramophone was very detailed, setting out the Society’s constitution, terms and conditions and projected recording programme. These were very like those of its acknowledged model, the N.G.S. – whose issues the Society regretted were too expensive to import (although some Japanese joined the N.G.S. on their own account, and had the discs posted to them). One not insignificant omission in the circular is a blank next to the entry ‘4. Advisers and Managers’ (I wonder if it was the Japanese or The Gramophone who hid the names?). I’m guessing that one of the Society’s prime movers and/or founders was Nomura Osakazu (1882-1963), better known under his pen names of Araebisu (as a music and record critic) and Nomura Kodō (as a novelist). Araebisu wrote extensively about records; I gather his verdicts on recorded interpretations were followed almost religiously. None of his gramophone criticism has been translated into English. Again like the N.G.S., the Society needed a manufacturing partner. In Britain and the USA, record companies and dealers supported gramophone and phonograph societies by throwing open their premises to meetings, lending equipment and donating discs (or, originally, cylinders). Most such societies were gatherings of hobbyists who met to hear lectures, listen to music convivially, and compare and share technical tips about playback, record storage and so on. Only a tiny handful issued records for their members – for which, in the days of wax and shellac, they needed a record manufacturer (the N.G.S. used three at different times: Columbia, Vocalion and Parlophone). For the Japanese Society, access to a manufacturer was provided by Anan & Co. Based in Kanda, Tokyo’s bookselling district, Anan & Co. was a leading importer of foreign records, notably Polydor, the export label of Germany’s Deutsche Grammophon. All the Society’s known issues were recorded in Germany by Grammophon and, initially, pressed there, until the Japanese government imposed a swingeing tariff on imported luxury goods, to aid domestic production and reconstruction after the devastating earthquake of 1923. In 1927, some two years after the Society was formed, like several other local firms, Anan formed a joint venture with its German partner and formed Nippon Polydor; the Society’s later issues may have been pressed in Japan but I’m not sure about that. At the moment, I know nothing about Anan’s ownership or staff, but it clearly catered to a highly discerning clientele: the Society’s first two issues were extraordinarily adventurous for the mid-1920s. The first consisted of three twelve-inch discs containing the two last piano sonatas of Alexander Scriabin: No.9 Op.68 and No.10 Op.70, each on three sides. 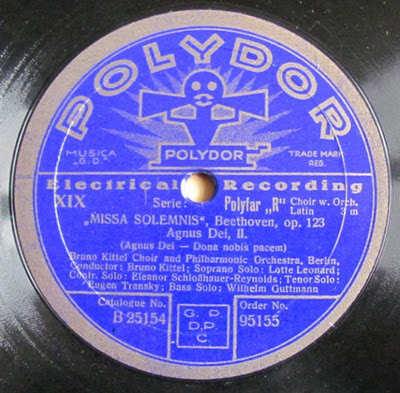 These were recorded electrically in 1926, in the studios of Grammophon, by Aleksander Sienkiewicz (1903-1982), a Polish pianist then based in Berlin (Sienkiewicz later emigrated to Brazil and became a respected teacher there). The discs were pressed in limited numbers and are now extremely rare, but remarkably they have been transferred by the Japanese label DiwClassics, in the second of its two surveys of historical recordings of Scriabin, both still commercially available. Sonata No.9 would not be recorded again for some 15 years, next appearing on Paraclete Music in a performance by Samuel Yaffe (1929-1980). No.10 was re-recorded at almost exactly the same time for another of the ‘society’ labels I’m studying, The Friends Of Recorded Music; the pianist was ‘the high priestess of Scriabin in America’, Katherine Ruth Heyman (1872-1944), about whom I now know quite a lot, and will write about soon if I can just get on top of the avalanche of information I’m finding on these fascinating figures. For information on the Amar Quartet itself, see the characteristically excellent note by Tully Potter, which Arbiter has laudably posted on the above page in its online catalogue. I see the only member of this line-up for whom no one seems to have dates is the second violin, Walter Caspar, so I’m going to stick my neck out and say he was born in Breslau (now Wrocław) in 1881, was concertmaster of the South West German Radio orchestra in Frankfurt for many years, and died in 1953. Corrections gratefully received. I haven’t yet investigated this set in great discographical detail but I’ve seen no evidence that it was issued in a special pressing for the Japanese Society; possibly members received the standard commercial pressing. The filler was a choral version of Beethoven’s setting of Gellert, Die Ehre Gottes aus der Natur Op.48 No.4, performed by the choir of St. Hedwig’s Basilica in Berlin, conducted by Pius Kalt. There have been various transfers of the set, most recently on CD by Saint-Laurent Studio of Canada, and by Universal Music Japan (the latter omits the filler), and as a download (gratis) by Dutch blogger Satyr (see above). After Hajime Fukaya’s letter, quoted above, I have found no further notice of the Society’s activities in the Western press. Yet my Japanese contact informed me that it was disbanded only in June 1935, so there may have been other issues which I know nothing about. By then Fukaya had co-founded a Japanese record magazine, The Gramophile, whose first issue appeared in February 1930, and which numbered Araebisu among its contributors. How long it stayed in print, I don’t yet know either. I am extremely grateful to the collectors Peter Adamson and Raymond Glaspole for this scan of the handsome label on the first disc from the Japanese Society edition of this set. I’m interested to see that it carries no face number, unlike all Grammophon and Polydor issues of this period. Many thanks to the author, Dr. Francesca Arnone, flautist and teacher, who has also sent very friendly answers to my e-mails. In her thesis, submitted in 2000 to the University of Miami, Dr. Arnone warned that ‘much information about Merry cannot be recovered’. There’s now far more about him out there – though still not his dates, let alone an obituary. Still, from Gallica, Ancestry.com, academic and other sources, including Dr. Arnone’s thesis, I’ve been able to piece together a fair picture of Merry’s life and work. I’ll concentrate on the ’20s to the ’40s, the decades most relevant to these discs and also the best documented in accessible sources. It has taken me so long, I’m jolly well going to give you the lot! Sorry if it’s tedious, but that’s who I’ve become: not just a grump but a bore. First, the flautist’s name: on the label of PAT 36, he is billed as Jean Merry, and on that of PAT 36 as Jan Merry. He seems to have used the latter as a stage name. As Nelson states, he was in fact born Jean Merry-Cohu; Cohu is a Normand name, and Nelson adds that Merry studied at the Conservatoire of Caen – where, I’m guessing, he was born. The Conservatoire was one of several institutions and people I contacted about Merry, in May 2016, and it had the grace to answer: no documentation survives from before Wold War II. Caen, the archivist reminded me, suffered very badly from Allied bombing raids in 1945. At the age of ten, Jan Merry was offered free lessons in Normandie by the flute professor at the conservatory who considered the boy to have natural talent. Since his widowed mother could not afford an instrument, he was given the school’s flute to use. Sessions gave the bride away. He also gave Merry a solo flute piece, Pastorale, perhaps a wedding present; the piece is now lost. In France, Merry continued his musical partnership with his wife, usually styled ‘Elen Merry’ in the French press, less commonly ‘Ellen Merry’. In February 1928, they gave a concert in Paris, performing duos by Loeillet, probably Jean-Baptiste (1680-1730), Bach, Albert Roussel and Philippe Gaubert; she also played solos by Brahms, Darius Milhaud, Emmanuel Chabrier and Chopin, and he played Debussy’s Syrinx. Another Paris concert, in January 1929, included duos by Louis Couperin, Benedetto Marcello and Handel, Pierre Hermant (1869-1928), Joseph Jongen, Quincy Porter, and Lili Boulanger. The same month, Jan Merry took part in a concert entirely devoted to works by Georges Hüe (1858-1948), and in July he played in a ‘Festival Albert Roussel’, with the composer at the piano for his Joueurs de flûte Op.27. In December, the Merrys joined forces for a programme juxtaposing old French organ music with works by Georges Migot (1891-1976); they would collaborate with Migot again. Il est excessivement rare d’entendre un ensemble de tels artistes. Chacun est virtuose et musicien, chacun peut établir seul, sa notoriété, chacun est digne de toute notre attention. Mais ces trois interprètes de race aiment assez la musique pour la servir en unissant leur triple personnalité. […] Quant à Jan Merry, je crois que, rarement, il a été donné de réaliser une telle alliance de la technique et des lèvres, car sa sonorité est à la fois distinguée et chaude, pure et variée sans cesse. […] On pressent un musicien cultivé, qui sait analyser la morphologie d’une œuvre, et mettre chaque détail bien en place. Nous le répétons; la sonorité de Jan Merry ne peut s’oublier après audition. Elle est rare. Et nous osons dire qu’elle est une des plus belles parmi celles que nous connaissons en Europe. Ars Nova did not last. A month later, on 21 January 1930, a second concert followed, with works by Bach, Handel, Boismortier, Couperin, Roussel and Petros Petridis (1892-1977), as well as the premiere of Migot’s Livre des danceries for flute, violin and piano (later orchestrated), and some of his Petits préludes for two flutes (or, as here, flute and violin). Besides a brace of broadcasts, Ars Nova gave two more concerts: on 14 November 1930, of works by Purcell, Couperin, Naudot, Boismortier, Ladislas Rohozinski (1886-1938), Carl Reinecke, Georges Enesco and Alexander Tcherepnin; and on 21 March 1931, devoted entirely to music by Migot. Although billed, Frantz was apparently not available that evening and was replaced by the Swiss violinist Magda Lavanchy (1901-76). I suspect marital problems. After that last concert, I can find no more listings or mentions of Elen/Ellen Merry on Gallica. By March 1932, she reappears as Elen (or Helen) Foster; many years later, she related that, after divorcing Merry, she was obliged to revert to her maiden name. Still, the two continued to appear together in concert – of which, more below. Also on the bill of that March 1931 Migot concert was the harpist Françoise Kempf (1901-1996). A few days earlier, on 16 March, Kempf and Merry had given the first of what would be many concerts and broadcasts together, as a duo and with other artists. I’ve found at least ten collaborations, from early 1931 until mid-1941, well after Kempf had reportedly undergone her mystical religious conversion in 1937. Meanwhile, on 22 January 1932, Merry’s other important musical partnership was apparently inaugurated, in his first documented concert with Pauline Aubert. They played works by Frescobaldi, Couperin, Rulman (not identified), Duval (presumably François) and Rameau. After a gap, they appeared together in October or November 1934 (listings vary), in the salon d’Hercule of the palace of Versailles. Dressed in period costume, they were joined by string players in one of François Couperin’s Concerts royaux; the Russian emigré Sacha Votichenko (1888-1971) played an original tympanon, a type of hammered dulcimer popular in Marie Antoinette’s heyday; and Antoinette Bécheau La Fonta (1898-1971) sang ariettes galantes of the ancien régime. It was Mme La Fonta who organized this and other historical concerts in ‘authentic’ (my word) settings. In December 1932, she put on a second concert at Versailles, at which Merry and colleagues played Mozart’s Flute Quartet in A K.298, and works by Jean-Marie Leclair, Couperin, Giovanni Battista Somis and (Pierre de?) Chauvigny (?-?). Pauline Aubert was not only a concert artist but also an editor and composer. She unearthed forgotten works, such as a cantata entitled Jupiter et Europe and attributed to one A. Pasquier (not identified). She and Merry performed it in late 1934, at a concert of the women’s orchestra conducted by Jane Evrard (1893-1984), alongside a flute concerto by Michel Blavet. In March 1935, Parisian concert-goers heard Aubert’s Poèmes persans, for voice and flute, performed by Merry and the soprano Madeleine Chardon. In April, Aubert and Merry gave a broadcast talk, with music, on ‘Les Couperins [sic] interprètes de l’amour’. In the summer of 1936, Merry and Aubert returned to Versailles, giving concerts in the palace’s Salon de la paix, and in the Salon des jardins in the Grand Trianon. In December, they played together in an upmarket Paris showroom or gallery. Thereafter, I’ve found nothing until April 1939, when Merry and Aubert were in The Hague, playing works by Blavet, Louis de Caix d’Hervelois, Jean-François Dandrieu, Louis Hotteterre (one of several musicians of this name), Rameau and Charles de Lusse. This was only the second trip I have traced which took Merry outside France before the War; the patchiness of periodical digitization and access means I’ve probably missed others. Meanwhile, Merry had not abandoned the moderns. On 12 December 1935, he took part in the inaugural concert promoted by La Spirale, playing the Six petits préludes for flute and violin by Georges Migot, the group’s president. This served one of la Spirale’s aims, which was to privilege repeat performances over premieres, in its wider mission to promote contemporary music, French and foreign, in concert. On 5 March 1936, La Spirale put on an American programme, for which Merry and his former wife Elen Foster, alongside other Spirale members such as Olivier Messiaen, played works by Harrison Kerr, Roger Sessions, John Alden Carpenter, Wallingford Riegger, Isadore Freed, Charles Ives and Quincy Porter. Merry played Riegger’s Suite for flute alone, and revisited Porter’s Suite in E for flute, violin and viola, which he had premiered with Porter himself almost exactly five years before. On 16 March 1937, Merry took part in the second concert promoted by another new group, La Jeune France. Founded the previous year, it’s now remembered mainly for its most famous member today, Messiaen, but it numbered another composer more important to Merry: André Jolivet (1905-1974), also a member of La Spirale. In 1936, Jolivet had composed Cinq Incantations for solo flute, and on 14 January 1937 Merry premiered some of them at La Sorbonne, reportedly because his peers were too conservative for such music. Later that month, he gave a second, private performance of some or all of the Incantations; and at the March concert of La Jeune France, Merry played three. Jolivet dedicated the cycle to Merry, whether before the premiere or in recognition of his advocacy I don’t know. Soon after composing the five Incantations, Jolivet wrote a free-standing Incantation pour que l’image devienne symbole, originally scored for solo violin (G string) or ondes Martenot, but premiered by Merry in 1937 on the flute (I have not identified the occasion); the violin premiere was not given until 1967. In May 1938, at a salon concert organized by La Jeune France, Merry again presented three of the Incantations, as well as two pieces by another member of the group, Yves Baudrier (1906-1988), for which the flautist was joined by Elen Foster at the piano. The programme also included works by the British composers Alan Bush (1900-1995) and Alan Rawsthorne (1905-1971). Merry and Foster repeated the Baudrier items at another concert of La Jeune France later the same month. Intriguingly, in March 1939, at a concert held by La Jeune France in the salon of the duchess Edmée de la Rochefoucauld, Merry played the second of the Cinq Incantations while Foster executed a dance of her own devising. Mrs. Eleanor Foster Cohu of Claremont, N.H., a resident of France for 14 years before the invasion, was the guest speaker before the members of the Montpelier Rotary club Monday afternoon. Mrs. Cohu is an American girl and left Lisbon, Portugal, last Oct. 5 for the United States. She told of the first bombing on June 3, when the planes came down about noon, two bombs falling where she was staying, and two women being killed because they had wished to remain in their dining room, rather than seek shelter. She told of their laborious travel south […] to Pau, where they kept in hiding for six months. Mrs. Cohu spoke of the good work the American Friends society is doing in France, in Marseilles alone feeding between 30,000 and 40,000 school children each day. Everything this Quaker society collects, goes to France, she said. After the Armistice, Jan Merry was presumably discharged and returned to occupied Paris. In February 1941, he played two of Jolivet’s Incantations at an public lecture by the composer. Later that year, Merry gave his first performance under the aegis of Le Triptyque, a concert series founded in 1934: on 5 July 1941, for a programme of Bach, Handel, Michel Corrette and others, Merry appeared with the tenor Paul Derenne (1907-1988) and the organist Marthe Bracquemond (1898-1973), who would later write a Sonatine for solo flute – whether for Merry, I don’t know (she had already written a work for him and Françoise Kempf to perform). In July 1942, he took part in a Triptyque concert of music by Arthur Honegger, with the soprano Noémie Pérugia (1903-1992). Most important of all, on 7 May 1943, Le Triptyque devoted an entire concert to Charles Koechlin (1867-1950) with, again, Pérugia, a pianist and three wind soloists. Merry premiered two of the composer’s three Sonatines Op.184 for solo flute; he was also joined by his younger colleague Roger Bourdin (1923-1976), probably in the Sonata Op.75 for two flutes, and by the clarinettist Jacques Lancelot (1920-2009), possibly in the Divertissement Op.91. The concert marked the beginning of an important association, which would culminate in one of the monuments of solo flute music, and the subject of Dr. Arnone’s thesis: the ninety-six Chants de Nectaire, composed from April to August 1944 and named after a character in a novel by Anatole France. Merry premiered several of the Chants, some of which were dedicated to him by Koechlin (as is one of the Sonatines Op.184), and he continued to champion the Chants until the end of his career. Which career, though? On that 1924 passenger list, Merry’s occupation was not given as musician – and he never became a professional flautist. For his entire working life, he was an electrical engineer, specialising in the lighting of halls, tunnels, streets and other public spaces. In this capacity, he was always known as Merry Cohu, which probably explains his slightly but distinctively different stage name (I wonder if he first used Jan in the US, to avoid any possible confusion with the female name Jean?). He seems to have qualified as an engineer in 1923, and he obtained a doctorate from the University of Caen with a thesis entitled Étude de quelques propriétés photométriques caractéristiques de certains verres diffusants à faces parallèles... [‘Study of some photometric properties characteristic of certain types of diffusing glass with parallel surfaces…’], published in 1932. By 1935, Merry Cohu was Chief Engineer of the Research Group of France’s Society for the Improvement of Lighting, and by 1938 President of the lighting and heating chapter of the French Electrical Association. By 1959 he was General Secretary of France’s Committee for Lighting, and a consulting engineer to the leading Dutch electrical firm Philips. He spoke at conferences and symposia, and published extensively, from a 1924 article about light in a popular science magazine, to Récepteurs photoélectriques (École supérieure d'électricité / Malakoff, 1969). He translated at least one publication by a well-known physicist of gases, Frans Michel Penning (from Dutch, if you please). hoped to repay his “musical debt” to a talented and deserving pupil someday. That student would turn out to be his good friend’s son, Michel Debost. In 1943, a friend of my father’s, Jan Merry, started me on the flute. He loved to play. His teaching was based on reading — first the original Altès Method, then duets of the Baroque, and many Mozart duets. I still think this reading skill is essential, because many technical hurdles in repertoire are just bad reading. at an airport’s baggage claim in order to prove that his gold flute was indeed his property. In December 1951, at a concert in Paris devoted to Koechlin’s works, the composer’s disciple Pierre Renaudin read the passage from Anatole France’s La révolte des anges which had inspired the Chants de Nectaire, after which Merry performed his own selection of five Chants. In her thesis, Dr. Arnone reproduces the programme of a concert given as late as August 1978, at which Merry played two Chants and one of Jolivet’s Incantations. Still, I would like to know more about Merry’s later life, including his work as an engineer. And it’s particularly irksome that I can’t find a notice of Merry’s second marriage, to a singer whose name I don’t know – possibly Magdeleine Camberlein. Their names are linked on a French genealogical site, but everything about his wife is hidden. One of the few details about Merry, rather sweetly, is his family nickname: ‘Tonton La Flûte’. Une « Sonate » de Haendel (Pat. 37) et une « Suite » de Philidor (Pat. 36) sont jouées sans poésie et souvent sans justesse par le flûtiste Jan Merry. I feel that’s harsh. Most reviews I’ve found of Merry’s Pathé discs are complimentary, though about the music rather than the performances (which was usual at the time, in reviews of records containing rare repertoire). Still, I must admit, what with the moments of off tuning and occasional scrambles, I don’t find Merry makes a particularly beautiful sound or lasting impression here. But what in fact was Merry’s sound? That’s another reason this post has taken me so long. I’ve been itching to get blogging again, and especially to transfer some of my growing collection of 78s. Again, Jolyon and others have brought home to me the importance of transferring at correct pitch; but I don’t have a fully working varispeed turntable – only three which need attention… I chose these two Pathé discs, partly because I thought they’d be ‘easy’ to transfer, and partly because I wanted to listen to them to answer some discographical questions. Oh dear – once again, little did I suspect… My copies are in goodish condition, and they responded well to light digital restoration. But when I played my transfers to a friend with perfect pitch, he wasn’t happy. So another friend kindly shifted the pitch, which didn’t entail a change large enough to cause artifacts, luckily. Now, my first friend was happy, but a flute historian I sent the shifted versions to, and whose opinion I very much respect, wasn’t. This all happened a year ago, and came on top of a sorry saga of me attempting to buy a varispeed turntable on ebay and being messed around by an ethically, socially and orthographically challenged seller, plus buying a second copy of one of Merry’s discs only to find I already had it. A few final things. There is one, just one, tantalising rerefence online to a commercial recording by Jan Merry of Koechlin’s Chants de Nectaire, supposedly issued on 5 LPs by the little-known French label Encyclopédie Sonore Hachette. That would be extraordinary, if true, because I’ve seen no mention of this possibly complete recording in any printed or online sources I have consulted (including an entire website devoted to the Chants). The only confirmation I can find is a listing of another Encyclopédie Sonore issue, containing a recording of Racine’s Phèdre, performed by a cast including Emmanuèle Riva, directed by the label’s founder, Georges Hacquard, and with ‘Flute music written by Charles Koechlin, performed by Jan Merry.’ Very much in a French tradition of incidental music for solo flute which goes back to Debussy’s Syrinx, Hacquard’s production, I would guess, draws on the above recording of the Chants. Having Merry’s recordings of Koechlin’s Chants would radically change our aural image of him: for all their interest, these Pathé discs are really Aubert’s affair, with Merry playing a slightly secondary role. It’s a pity that his passion is so meagrely documented, but Dr. Arnone made a start in her thesis, and we’ve added a bit more detail. I’ve just come across the Netherlands’ superb digital portal Delpher, thanks to which I have details of some of Merry’s appearances in Holland. The ealiest currently documented in Delpher’s newspaper archive is an introduction to 18th century French music, given on 18 April 1939 to students of the Amsterdam Conservatoire, in the old building’s Bachzaal. It was presented by Pauline Aubert, who took the lion’s share of the programme, Merry joining her in pieces by Michel de la Barre and, possibly, Philidor. The following day, at the Gemeentemuseum in The Hague, the duo gave a longer public concert, again drawing on French baroque repertoire, which Aubert played on a harpsichord from the museum’s collection. No fewer than four Dutch papers reviewed the concert, not entirely favourably. Tempering the mostly positive verdicts on Merry’s playing were criticisms of his sound, intonation, and choice of apparently weak solo items by Hotteterre and Blavet. Not until 1961 does Merry reappear in these digitized Dutch newspapers, again performing at The Hague’s Gemeentemuseum on 16 November; no details of the programme or other artists were reported. In February 1964, Merry gave his last concert documented in these sources, at Amsterdam’s Institut Français, also known as the Maison Descartes (recently sold). With the pianist Nicole Aubert (her relation to Pauline is unknown), Merry performed French music by the baroque composers Blavet, Leclair and Caix d’Hervelois, and, from his own time, Migot, Koechlin, Francis Poulenc and Jehan Alain. The only review I’ve located was damning, pronouncing the baroque first half ‘a disappointment’, and finding little more to commend in the ‘moderately modern’ pieces; only Poulenc’s Sonata won favour, as a piece and a performance. The only grail I own is this tiny cup. I won it at school in 1976 – yes, don’t laugh, in them days I was quite nippy – on account of being in the winning under-17s 4 x 100m house relay team. I was the anchor, and my charming comrades later regaled me with descriptions of my competitors gaining on me over the home stretch. Team sports? Humbug. This, though, is definitely not a grail, despite what you’ll read if you ever try to buy a copy. The Mozart quartets have been transferred from LPs and issued in Japan, by Green Door on CD (GD-2041), and by Mythos Lord (see?) on a variety of CDRs (NR-6046 plus various suffixes, depending I suppose on how much gold you require on your plastic). The Mozart and Tchaikovsky quartets have also been transferred from LPs and issued on CDR by Forgotten Records (thanks again to ‘LPCollector’ for alerting me to this disc). In 1978, Belgium’s Fonds Georges Maes issued a 3-LP set entitled ‘Georges Maes een aandenken’ / ‘Georges Maes en mémoire’. It too contains the three Mozart quartets, plus the Tchaikovsky, and there’s other material from broadcasts. Somewhere in the Cave is a copy of this box, but I can’t lay my hands on it at the moment. If memory serves, which these days it tends to less and less, I believe the quartets are also taken from LPs. I know of no other transfers, much less reissues from original master tapes. And that’s what makes me grumpy about this chalice-chasing. If everyone the world over who covets the Haydn Quartet’s LPs clubbed together, and put up even a fraction of what the originals cost, surely there’d be enough to mount a commando raid on the lock-up, extract the tapes, dub them and then slip them back, with a box of Milk Tray, before anyone notices? Or even enough to pay the men in suits – though I gather they’ve got greedy of late. Still, this is a nice record, and I flatter myself that it has scrubbed up very well. I tried to leave in all the bow noises and chair creaks, and there’s some foot stamping and other noises off. The performances are simply lovely, and I very much like the close, dry, slightly boxy sound - that’s how most instrumental records were balanced until the present fashion for ecclesiastical bathrooms. I have now ascertained the recording date (see above ) but not the venue. My guess is Brussels, like the session(s) for the Quartet’s sole Telefunken LP, which I got from Michael Gray’s indispensable ‘A Classical Discography’. I have also been put right about H.M.V.’s suffix –C export LP series – for which I’m very grateful to ‘Boursin’ (see comments, below). A few questions remain. Were these LPs routinely available in export markets, or only by special order? I mean, could one just walk into a classical record shop in Belgium in the later 1950s and buy this, or did one have to know about it and order it specially? Is that why are the Haydn Quartet LPs so rare? Seems a shame that even the Belgians didn’t get to enjoy one of their finest ensembles more. Clearly, I’ve a lot to learn. Further answers gratefully received! By the way, don’t get me wrong: I’ve nothing against collectors – I am one myself – or original copies of obsolete recording formats. Clearly, where master tapes have been destroyed or lost (a sackable offence, in my view), an original is the only source of a recording. Even after being transferred, it should be preserved rather than being discarded, as so often happened in the past. Not only are transfer equipment and techniques constantly evolving, the originals are interesting commercial, aesthetic and historical objects. I know some people like to play original records on original equipment, and they can sound very good. I’d just prefer a digital reissue from master tapes – which, in any case, need to be preserved before it’s too late. That’s if the masters survive – shouldn’t we at least find out? In the meantime, download the 8 mono FLACs, fully tagged (except for exact recording date – apologies), in a .rar archive, plus images, here.